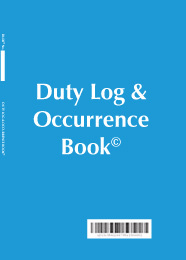 If you feel that the existing log books do not exactly meet your requirements, CWC Services can make customised (bespoke) books for your organisation. CWC Services can completely adapt their books to suit your needs. Developed products will be developed with the features of their existing products, with numbered pages and unique book numbering, with advice on Best Practice and FOI applications. CWC Services would recommend that this is standard as it ensures that your books are evidentially sound. CWC Services' existing standard books have been legally validated. Designed to specification for any organisation which needs to record incidents or activities of managers.